Even though I spend 23 and a half hours of every day rushing around after my puppy, I still call myself a cat person. I was brought up with two tabbies, Jeremy and Jemima - and my parents still have 3 mogs: Mackenzie, Millie and Flossie. So, I was delighted to see that kitties were making it as a microtrend for AW11/SS12 - by some fantastic designers. 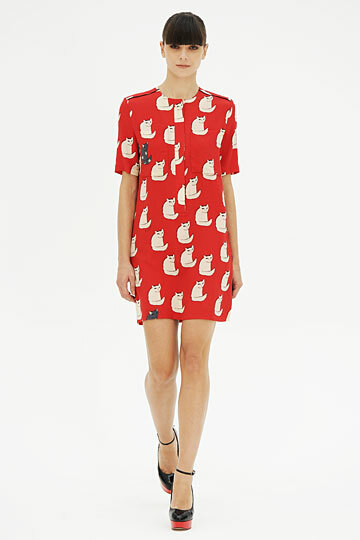 Miu Miu started it, with their RTW collection covered in our feline friends. These platforms (above) - are cute as a stand out piece in a classic outfit. 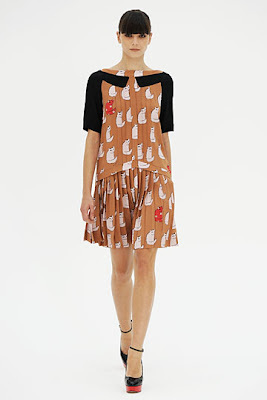 We also loved their print skirts and silks (below) - the main capsule point to take from this is the collars - easy to replicate on the high street. 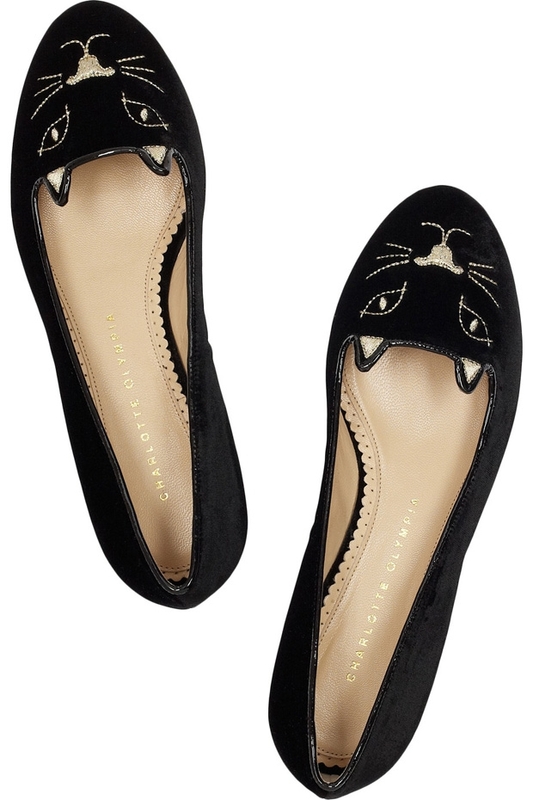 Charlotte Olympia followed suit and brought out a gorgeous pair of cat themed smoking slippers / pumps. These are so cute and already adorning the feet of many a celebrity, including Kylie Minogue who tweeted about them a few weeks ago. Absolutely love these - but waiting for a pair without the £495 price tag (for a pair of flats, seriously?!). Next up, Victoria Beckham and her Victoria collection - cheaper, ie, made for the rich rather than the ridiculously rich. Victoria used a number of retro cat prints in her dress collections, including this one that she wore whilst in New York for fashion week last week. Love the neutral colours with a tint of red in the detail. Absolutely gorgeous.